The MINI 100 Series circuit breaker is designed as a drop-in replacement for mini type fuses for use in critical safety circuits, or where an automatic resettable protection is needed. 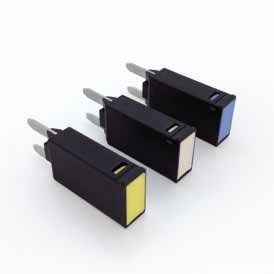 The MINI 100 is available in ratings up to 30 amps with a color tap cover. With an exceptional a history of more than 90 years, Sensata Technologies is leading supplier of sensors and bimetal switches. Sensata Technologies MINI 100 Footprint Series of circuit breakers are designed for wiring harness protection in 12V/24V DC automotive, agriculture, marine, and robotic applications. The MINI 100 is an ideal protection device to guard against momentary overloads. The MINI 100 can be mounted in a 280 and/or ATM footprints also known as MINI mini-fuse location. Optional mounting needs can be addressed by contacting Sensata Technologies. This bimetallic device is sensitive to both over-current and over-temperature fault Configuration conditions. This device is especially designed with a Secondary Circuit Protection that uses a fusible link as backup protection for end of life failure modes of the device. Sensata Technologies is an ISO and QS registered company providing world-class quality products. The SCP is designed for short circuit protection similar to a fusible link with the benefit of a resettable circuit breaker feature. 24V and SAE Type 3 versions under development. Contact Sensata Technologies for further information.